Haryanvi sensation Sapna Choudhary, who is known for her energetic dance performances, was recently in Bhopal for a stage show. Now, another videos from the event have surfaced the social media and are going viral. 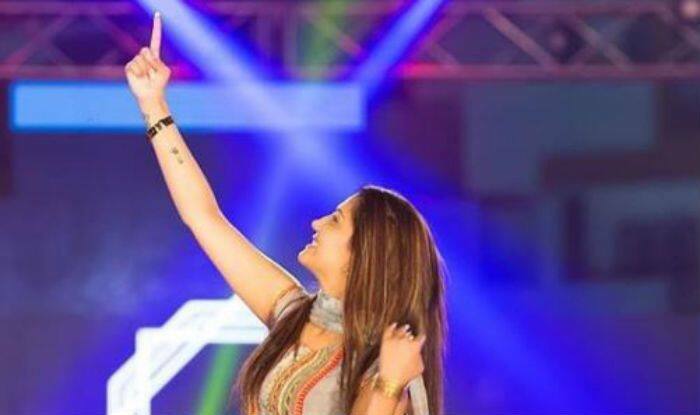 In the video, Sapna is seen setting the stage on fire with her hot thumkas on Haryanvi song ‘Kurti Dhili Aankh Zeherili’. Dressed in a yellow salwar and kurti, she flaunts her dancing skills on the stage. At the background, a crowd can be seen hooting and shouting, as Sapna entertain her fans. Earlier, her video dancing to her latest song ‘Taliban’ and crowd can be seen cheering and hooting for their favourite performer. Dressed in a grey salwar-suit, she flaunts her thumkas on the dance floor. She has accessorised her look with bangles, a pair of earrings, a nose ring, watch and minimal makeup.